Battle companies is a GW skirmish game originally published in a white dwarf article. It uses LoTR rules for battles and includes rules similar to that of mordheim warband progression in-between battles. •	I hope to start running the Campaign at the beginning of May 2014. This give players time to sign up and muster there Battle companies. •	The length of the campaign will depend on numbers and level of interest over time. •	The campaign rules will be basic, hopefully through experience and community involvement we can develop them further and implement changes overtime. •	Players should keep track of deaths and kills as a reward system may be implemented for the end of the campaign. •	Please sign up if you are interested in participating in the campaign. •	Exceptions to the rules can be made if required. •	Games to be played at clubs and Hobby stores. •	Results of games should be posted on this thread or sister threads (TGA). •	Everyone participating in the campaign must be given the opportunity to verse everyone else once, before playing against an opponent for the second time. •	A weekly scenario should be chosen in advance, all participants playing that week should use the scenario chosen in campaign games. •	Each player choses one region on the map as their Capital at the start of the campaign. This represents there starting zone from which initial attacks can be launched against neighbouring territories. 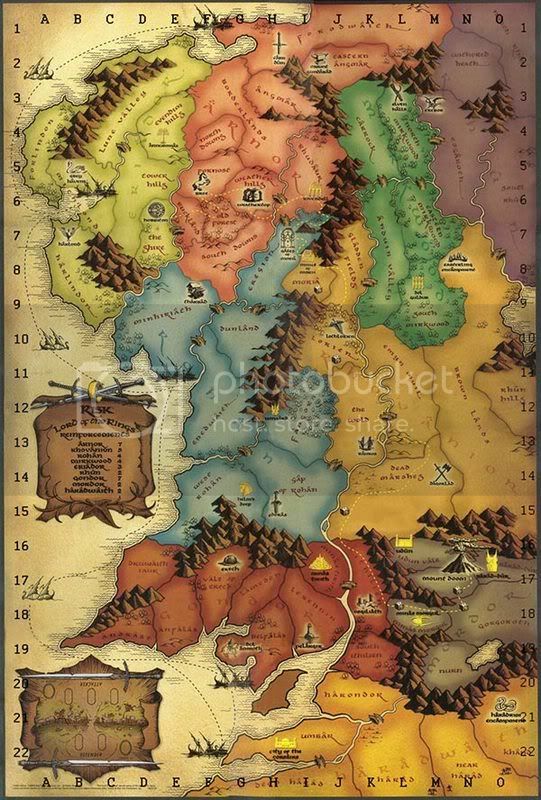 •	If possible Capitals should be placed on map regions in which the faction originate in the LoTR fiction. For example a Roharn faction should have a capital placed somewhere in the lands of Roharn. •	Capitals may never be placed next to a region occupied by another player’s capital. •	A battle company may launch an attack from any region controlled by that player. •	A battle company may launch an attack from any region controlled by a non-player. •	You may not attack a map region that is blocked by mountain ranges or bodies of water (lakes and streams). •	If you control a region with a port you may attack other port regions that are interconnected. •	An attack may be launched from a region you don’t control if it is controlled by a player who is faction aligned to yours (forces of good OR evil). -	You may only do this if you control map regions connect to the region in which you wish to launch an attack from. -	Both you and the regional owner may not launch attacks from that same region at the same time. -	If you successfully win the battle then the conquered region come under your control. •	Attacking an opponent’s capital. May only be made after all neighbouring map regions to that capital have been conquered by yourself or other factional aligned players. -	If an opponents capital is situated on a region boarded by the map edge than you only need to control all visible regions surrounding the capital in order to attack the capital. •	If you successfully win a battle and conquer a region then that region come under your control. •	If a region that you control is attacked your battle company may defend that region even if it is launching an attack from a different map region that you control. •	If a region controlled by a non-player is attacked a defending player must be found. The defender uses their battle company to defend the neutral territory. •	If the defender successfully win OR draw the battle then that region remains under its current owner. Last edited by Hobdoglin on Fri Apr 04, 2014 1:04 pm, edited 3 times in total. Count me in for sure. Good time for the May start, something to look forward to post Helm's deep. How about more flexibility for clubs/GWs to play at? I personally have little inconvenience with it, just thinking about other peoples most convenient traveling/organising games to keep the momentum of the campaign going. As long as people post up the results on the thread and/or Battle Report in and gentlemanly/Lady-like manner post-battle. I don't see why the games can't be couldn't be played any where though I haven't participated in a campaign before so are unsure of the physical practicalities of the organising. I am definitely in! Either Rivendell or Arnor for me! How many people will be needed for this campaign? I may actually go Mahud if no one is selecting them or harad. Or to balance good vs evil. The White Wizard makes the best cakes, the thought of which drives even sane Uruks into fits of frothing madness.... Do not come between the Uruk-Hai and their precious cakes. I'm interested. I haven't played battle companies in the past because I prefer larger scale battles, but this definitely seems worth looking in to. If I join in, it will be as the Fiefdom of Dol Amroth. So.no named characters are allowed I see? It's simply a warband of warriors, with one warrior thats pretty much along the stat lines of a Ranger of the North (AKA a Lieutenant of some sorts rather than a Captain). Although other warriors have chances to become "Heroes" along the way.